I built a head cabinet for my P1 using pine board from Home Depot, some generic tolex I bought from Mojotone, corners, handle, feet and chassis bolts from Hoffman. I used 3M '77' spray adhesive, which works fine if you spray the right amount on both surfaces and wait at least 30 seconds for it to get tacky enough before you lay down the tolex. The golden grille on the back is cut from a sheet that I got at Home Depot. 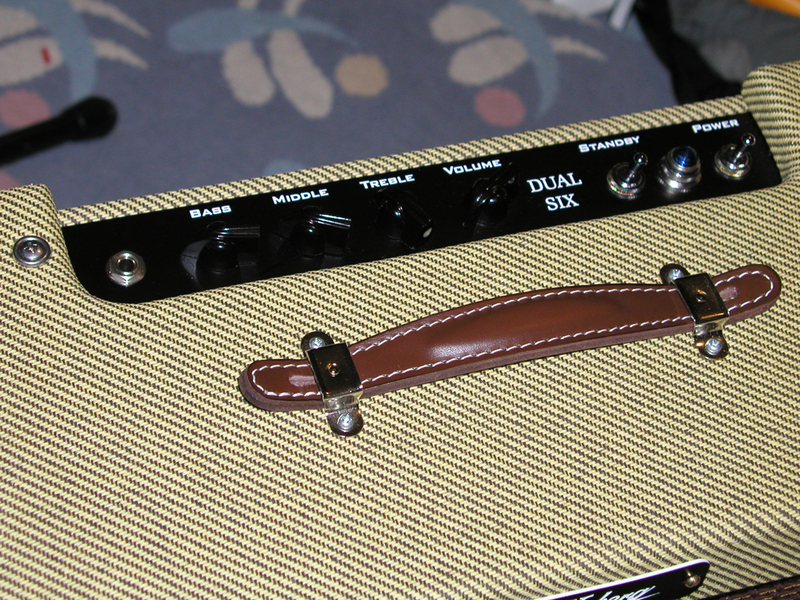 Since this was my first tolex experience, I made a lot of mistakes. If you decide to do this, make sure you read up on how to make corners, and practice first (or use a set of metal corners to cover your mistakes as I did). Faceplates from Bits n' Pieces (see below). 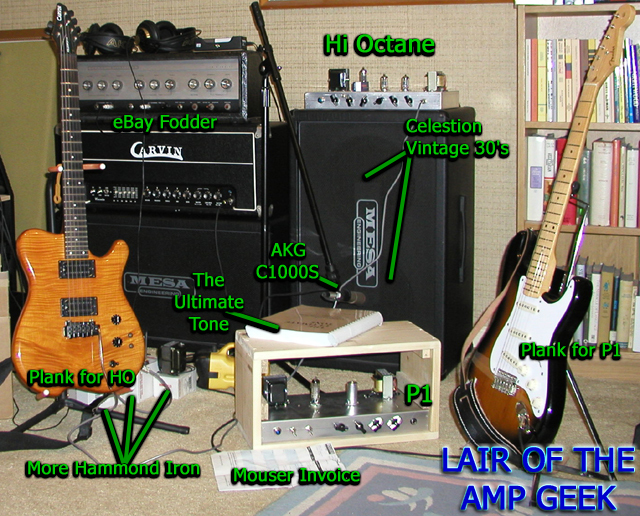 My second amp is the High Octane. 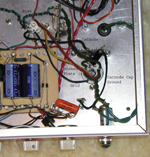 It's a more complicated circuit, with a multi-stage high-gain preamp. I used a turret board from Angela Instruments (www.angela.com), and the result is a lot neater than my P1. 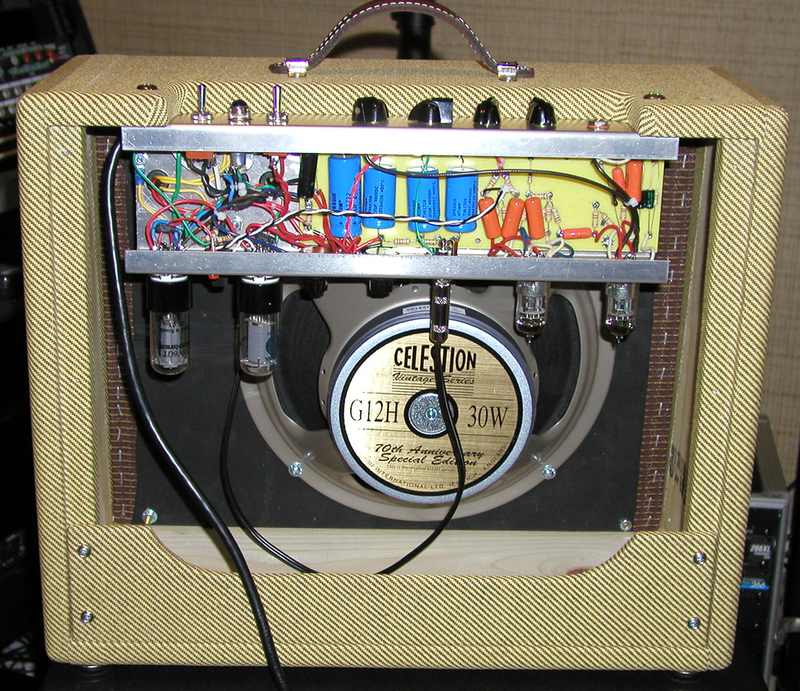 In September 2003, I built a another Hi Octane into a combo chassis. Here are some sound clips from the second half of 2004 - these are excerpted from live jams. Signal chain: Les Paul Standard, Dunlop Classic wah (w/fasel), H20 chorus/echo, HO combo, Hot Plate, Celestion V30 in open-back combo cab. I added an octal socket to my original HO based on the Kurt Leniger schematic at ax84.com. Sounds great with a KT66 or NOS 6V6 or 6L6. The inside pic has labels to show how I wired the octal socket in parallel with the existing EL84 socket. I drilled a new hole that was on the path of the original heater wires and rewired the heaters. 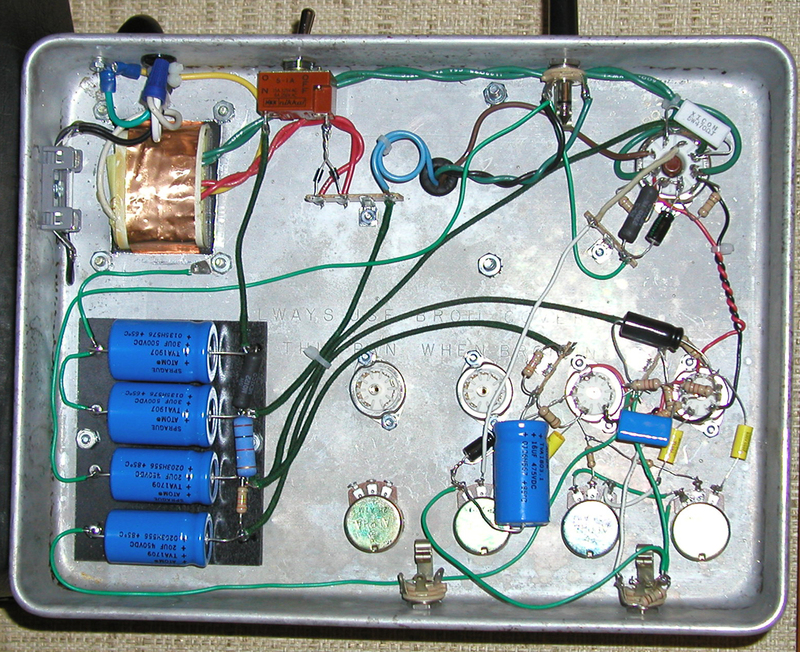 A terminal strip was added to hold the cathode resistor and cap; the resistor is wired in series with the EL84 cathode, and the cathode bypass cap is grounded separately. Grid, screen and plate wires are just in series with the EL84 socket. It only took about an hour to do this mod, and it was well worth it. If you're wondering what a Univalve sounds like on low-power mode - this circuit captures a lot of the same tones. 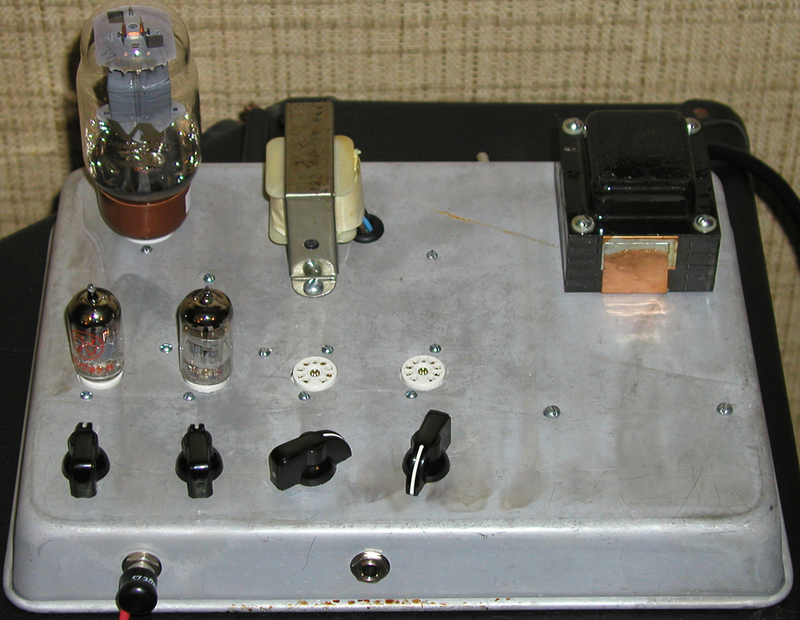 Here's a sound sample of the amp with JAN 5751s in the preamp and a GT 6L6-GE power tube. The filter definitely smooths out some of the high-end harshness in the EL84 output section, but I've kept it switchable because the stock sound has an "over the top" quality that I like, and the filter takes away some volume. On the other hand, the filter is a plus for high-gain settings where you want more of a singing sound vs. grit. (These clips were all recorded with the gain maxed out). I'm currently using an .015uF/1200v cap instead of the .047uF cap shown in the schematic. The resistor is a 5.6K/5W. To make it switchable, I put an SPST in between the cap and resistor (see this pic for a layout on a single terminal strip). See the AX84 BBS for background articles on the CF, or this thread for some current Mouser part numbers. 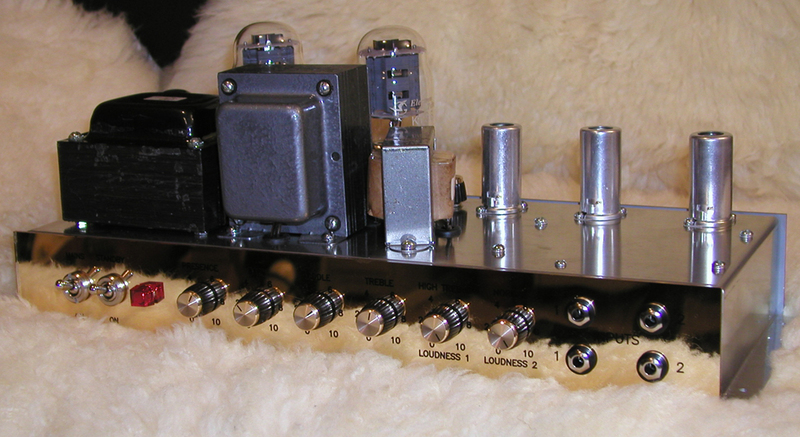 My third build is the AX84 November, designed to emulate the "plexi/ali" sound of old Marshalls at a lower volume. 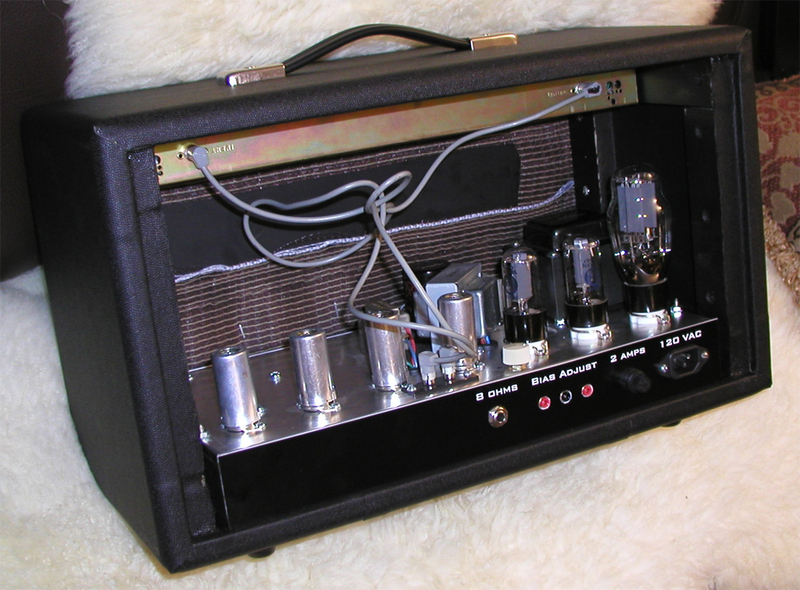 It utilizes two EL84 output tubes in a push-pull configuration, and has switchable fixed- and cathode-bias on the power tubes, and an ultralinear / pentode switch on the output transformer. I made my own layout from the version 8 schematic, using Visio. Printed life-size, it was taped onto a 10"x3.25" fiberglass board I got from Doug Hoffman, and I drilled for and installed the tinned turret lugs using Doug's turret tool. 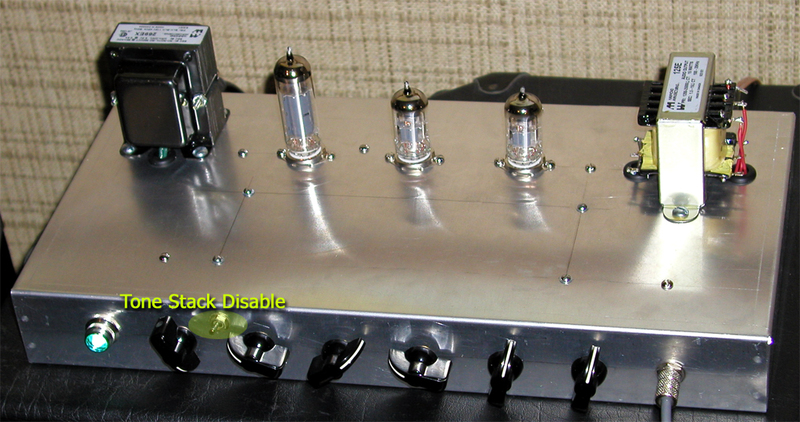 Tweaks tried: gain switch (shunt cathode bypass cap), bright switch (shunt bright cap), master volume (pre-PI). When I put a faceplate on and put the amp in a cabinet, I'll probably remove the tweaks, since I don't seem to make use of them very much. Favorite setting: jumpered and dimed. 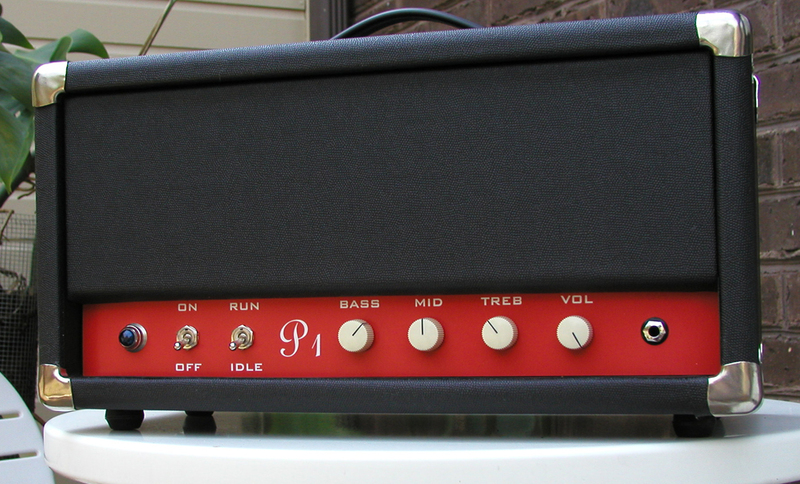 Push-pull with a bigger output transformer gives a much better bass response than you'll get in a small single-ended amp like the HO. The clean sounds are really sparkling, especially with the Presence turned up. Note: If I was going to build another November, I would definitely use a larger chassis, it's tight in a 16x8x2. In order to make some nice-looking front and back faceplates for my amps, I bought a copy of Corel Draw 10 and searched around for a laser engraving service in Pittsburgh that would take Corel Draw files. I found one and prototyped a few faceplates, which I think look pretty good! The faceplates I've done so far are zipped up for downloading: version 10 or version 9 or version 5. Update April 1, 2004: Just received my logo plate prototypes from Jeanne at BNP - check out the images above. Many thanks to Joe V. at www.amplates.com for helping me convert the bitmap to vector art! Looks awesome! 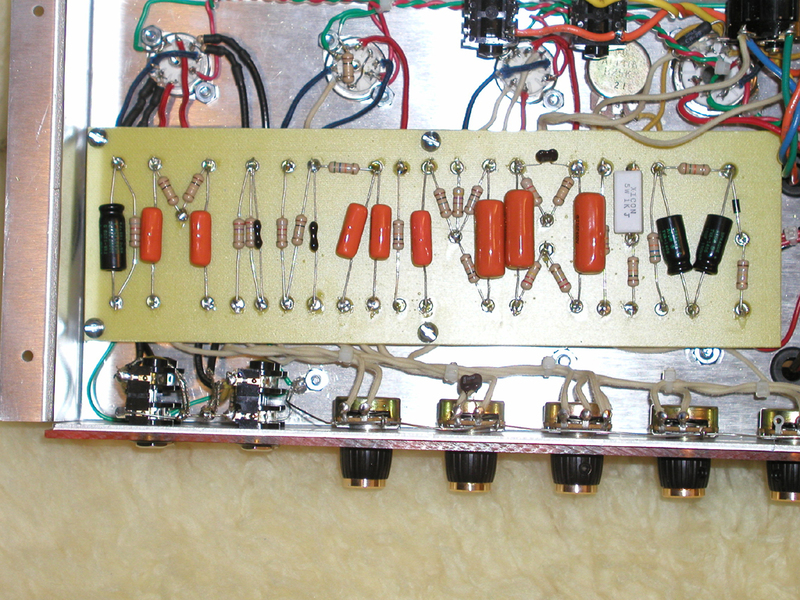 The "18-Watter" is a 2xEL84 push-pull circuit modelled after the famous combo amps made for a short time by Marshall in the 60's. 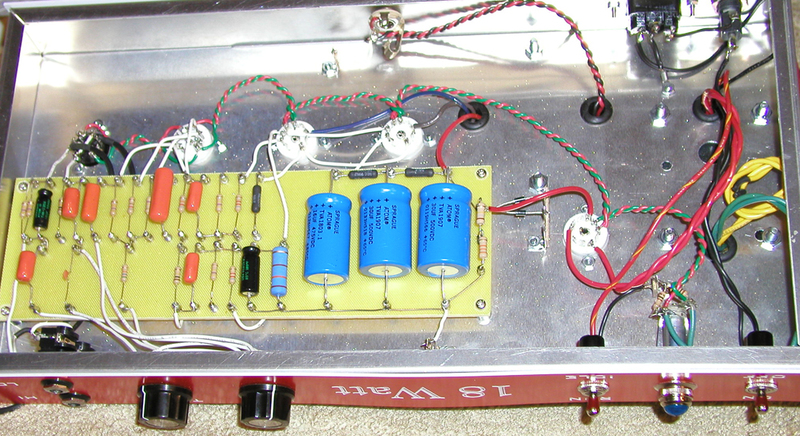 I used the "18-Watt Lite II" schematic posted by Mark Huss on the Yahoo "18watt" group. 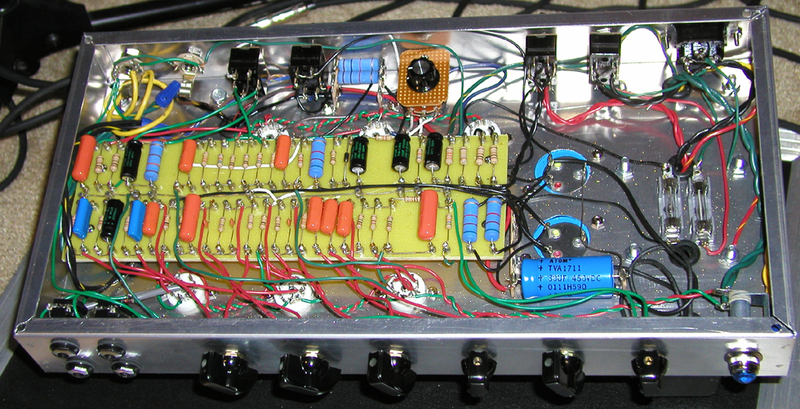 My first build used a Hammond 269GX PT, but I was only getting around 300v on the EL84 plates. 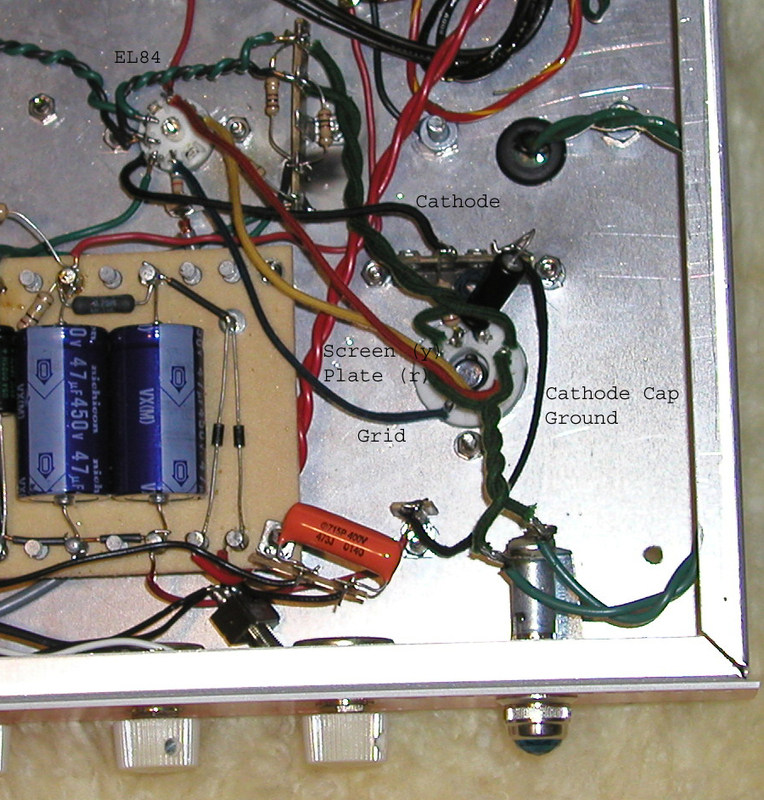 I swapped in a Hammond 270EX (recommended on the 18watt site) and increased the cathode bias resistor to 180 ohms. With a GZ81 rectifier, I'm getting around 350v on the plates. Here's the .pdf file for my board and chassis layouts. 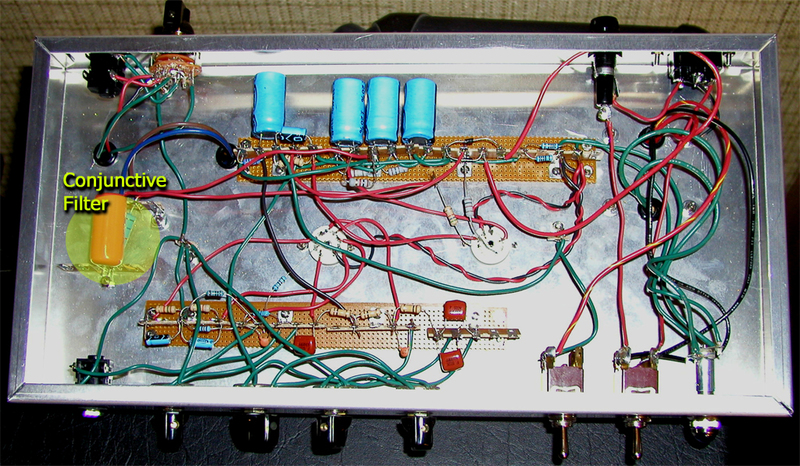 The California Dreamer is an AX84 project with 2 6V6 output tubes in push-pull and a reverb circuit. 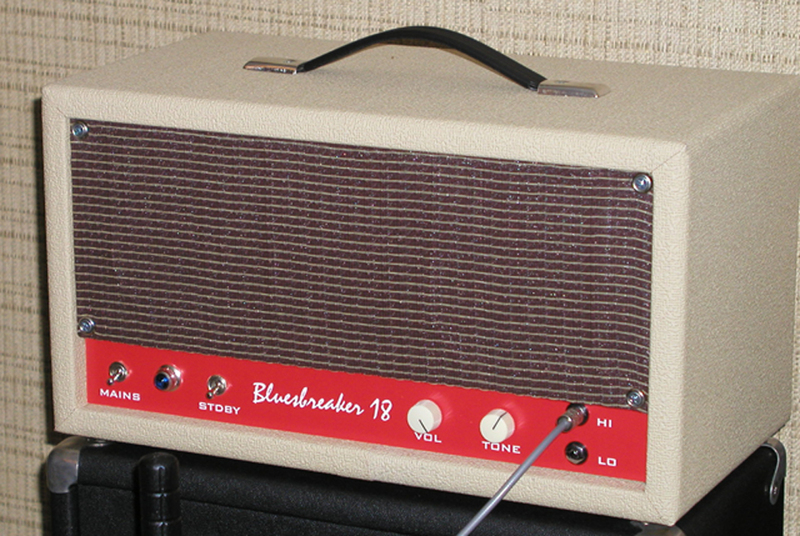 It sounds like an old Fender - clean and warm with great reverb. I did my build in a Hammond 16x8x2 chassis - a tight fit! I'm glad I took the time to install tip jacks and an external pot for setting the bias. 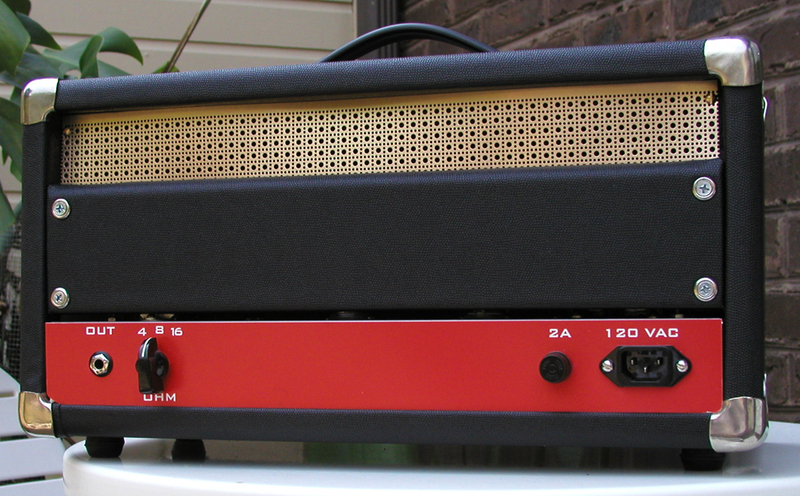 This head has the distinction of being the first amp I built for someone else. My friend Charles was complaining about how his solid-state practice amp sounded "plastic", and this seemed like a good antidote. 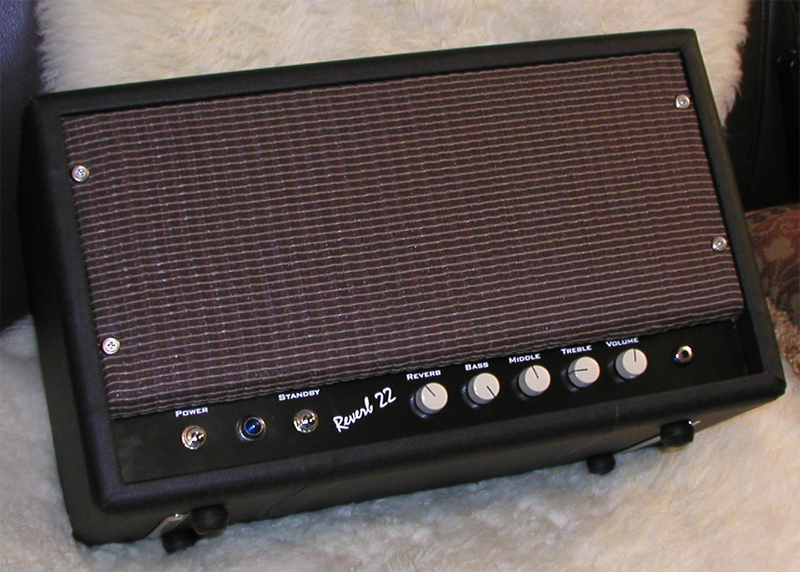 Charles wanted to call it a "Reverb 22". Thanks to CraigB and DaveZ for feedback when I was debugging. 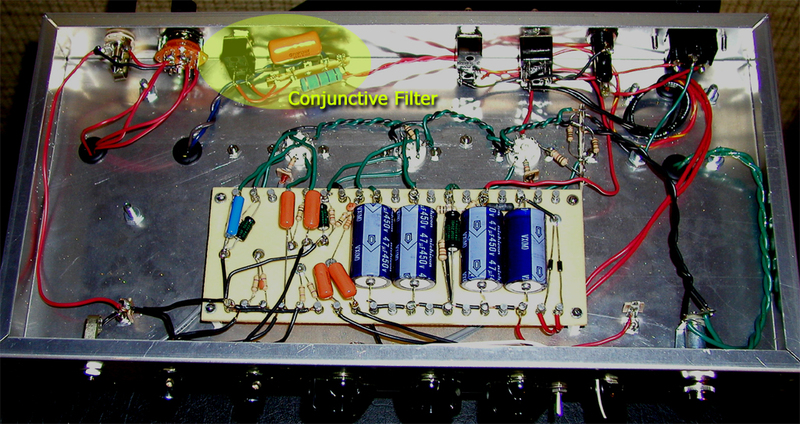 This amp uses the stock New Sensor BFDR replacement iron and an Accutronics pan, which sounds great. May 2, 2004: The Cali Dreamer build gets a tuneup. I recently completed a combo cabinet for a second Hi Octane build. Click on one of the images to open a separate page with lots of photos and a sound clip. Sound clip with Shuguang KT66's at ~42ma, JJ 12ax7's. Pres=5, Vol1=10, Vol2=10 (jumpered), Bass=4, Mid=5, Treble=6. Guitar is a late-model Les Paul Standard Plus, bridge pickup, volume and tone at 10. 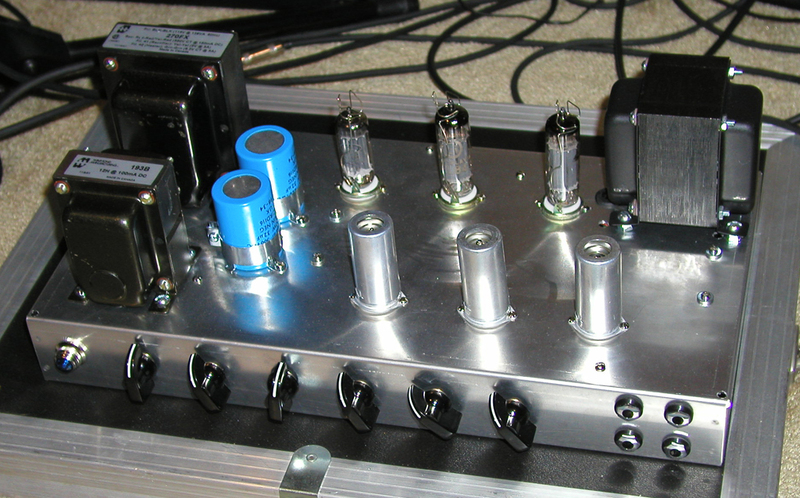 Brief Sample with Groove Tube KT66-HP's at ~42ma, JJ 12ax7's. Pres=5, Vol1=10, Vol2=10 (jumpered), Bass=4, Mid=5, Treble=6. Note how much the bass notes "sag" on the low E string in the second half riff - attack is quite spongy at peak current draw. Guitar is a late-model Les Paul Standard Plus, bridge pickup, volume and tone at 10. 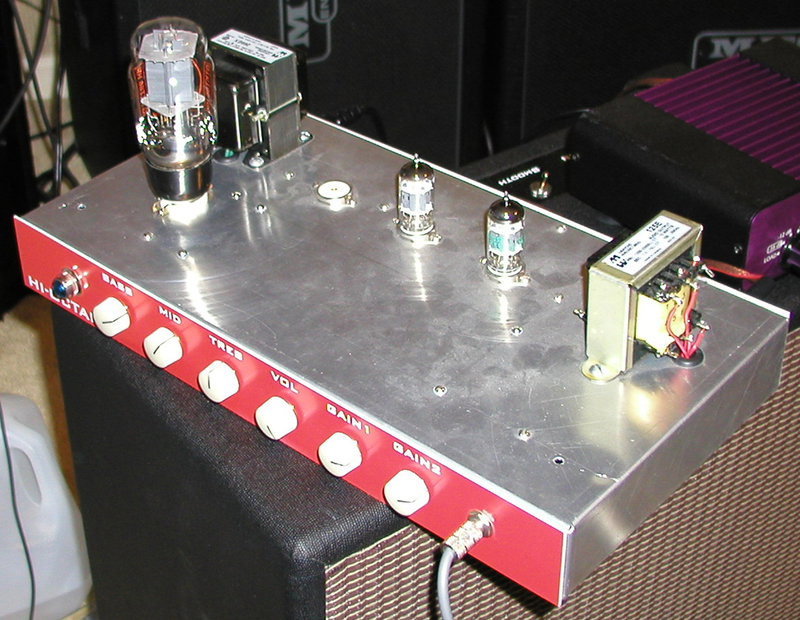 Here's a push-pull octal amp that's loosely based on Fender blackface specs (tweed Deluxe iron, but with blackface Pro/Deluxe Reverb preamp and long-tail PI feeding adjustable fixed-bias octal outputs). 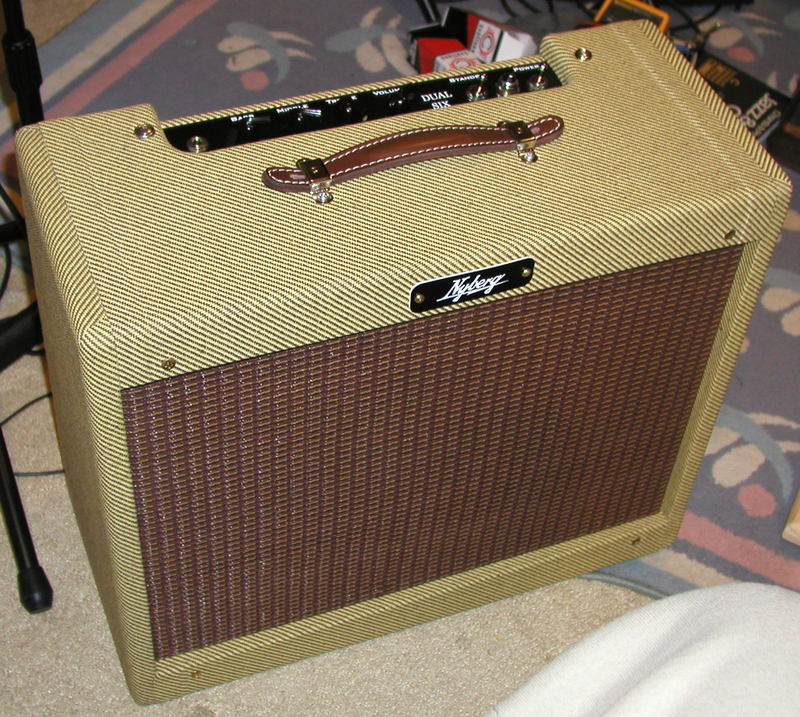 In chassis from Komboking and a tweed Deluxe repro cab from eBay. Broiler Pan Amp aka "Swamp Thing"
After hearing the broiler pan at a jam, a friend started calling it "The Swamp Thing", and thought up the alternate names for the controls (which are Lo Gain, Hi Gain, Bass, Mid, Treble, Drive). 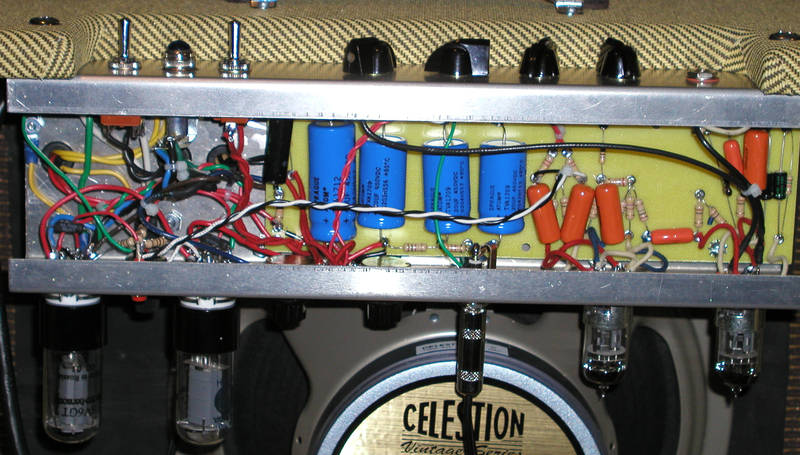 The rebuild sports a Celestion Alnico Blue and produces lots of harmonics. No negative feedback loop, very chimey, and the Blue speaker makes my V30's sound like cardboard in comparison. 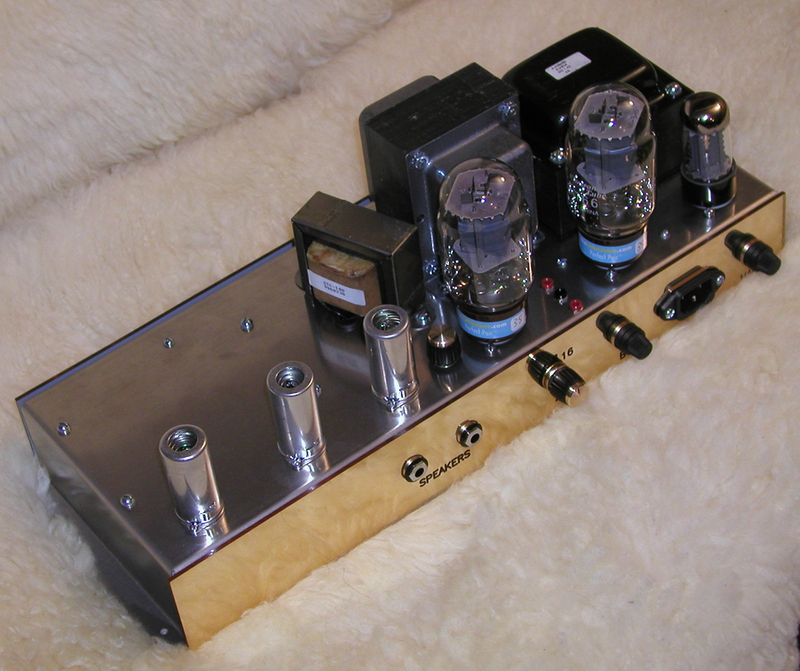 Beautiful clean and overdrive sounds at low volumes. Sound clip (03/04/05) of an incarnation with no tone stack. A schematic for the latest variation. The P1 and HO samples were recorded with the amps plugged into a Mesa 2x12 closed-back cab loaded with Celestion Vintage 30's. The cab was close-miked with an AKG C1000S cardiod condenser into a Mackie 1202VLZ mixer and digitized with an Echo Layla A/D box into Cubase VST. With a touch of chorus/delay/reverb from my old Alesis Quadraverb, or a TC Electronics G-Major on the more recent samples. 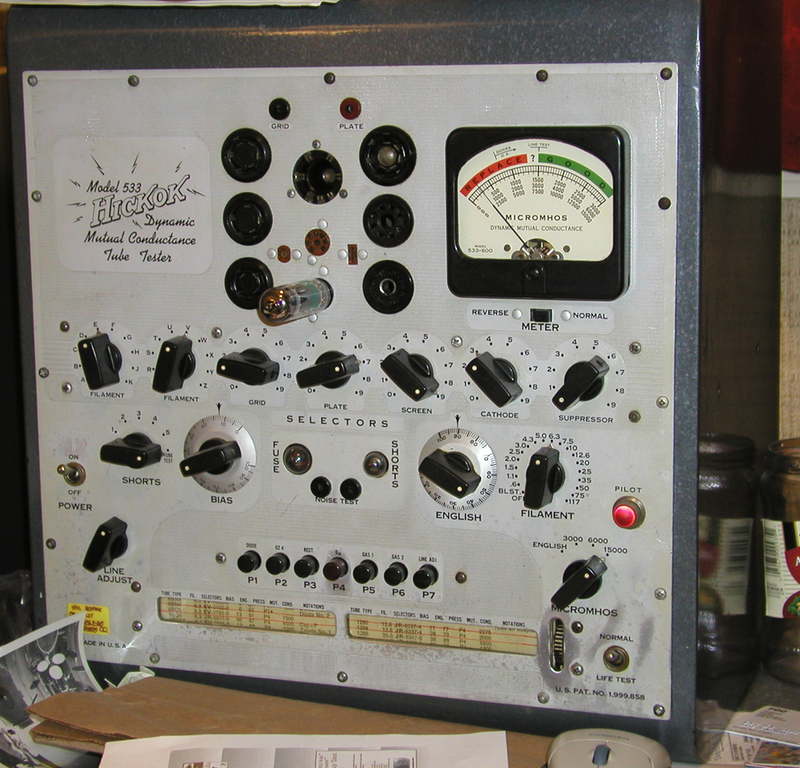 Pic at right above is a shot of my Hickok 533 tube tester. A Plus Guitars Great deals on Gibsons!